Until 1915, most Indigo dyeing was conducted in skein machines for cotton or loose fiber dyeing for wool. Skein dyeing of Indigo is still the best method for dyeing Indigo on very fine yarns for the delicate high-fashion fabrics. In 1915, the first rope dyeing machine appeared and only in the 1970’s was sheet dyeing introduced. The relative advantages of rope as opposed to sheet Indigo machines is a common subject of debate. Based on my 30 years of experience in this area, including as a consultant in about 40 denim operations worldwide, here are some basic observations that I have made in companies that had only sheet or rope dyeing, but also in many denim companies that employed both. These evaluations included mass-balance studies, benchmarking, weaving efficiency and overall fabric quality. A. Lower consumption of reducing agent per kilogram of yarn. The primary reducing agent utilized in Indigo dyeing is sodium dithionite, commercially known as sodium hydrosulfite. The amounts of this reducer that are consumed in Indigo dyeing are greatly in excess of what is necessary for the Indigo dyeing itself. In explanation, in order to reduce 100 kilograms of pure Indigo so that dyeing can proceed, only about 66 kilograms of 100% hydrosulfite are required for the basic reaction. The amount of hydrosulfite actually consumed in Indigo dyeing is often3 or 4 times this amount. There is often hydrosulfite wasted incurred in the initial mixing of the stock mix, due to excessive stirring or concentrations of hydrosulfite greater than 80 grams per liter which promotes anerobic decomposition. A great deal of hydrosulfite is lost because of contact with atmospheric oxygen at the surface of Indigo dye boxes as a result of aerobic decomposition. The surface losses of hydrosulfite are related to the volume and surface area of the dye boxes, with approximately 15% loss in larger Indigo boxes found on rope ranges and 50% or more in the smaller dye boxes found on sheet ranges. The scientific explanation for this phenomenon is related to what is known as Specific Surface Area (SSA). The greater the SSA (the quotient of the surface area and volume), the more rapidly the sodium hydrosulfite is oxidized. The time for half-oxidation (50% loss) is inversely proportional to the SSA, which means that decomposition is slowest in a large dye tank with a relatively small surface area. There are other factors involved such as the initial concentration of hydrosulfite in the dye boxes – a higher initial concentration decomposes more slowly. However the most significant source of loss is through surface contact and air brought into the dye tank by yarn. The instability of hydrosulfite in smaller Indigo boxes is also the primary cause of color variation in Indigo dyeing, which on rope ranges is much better controlled. It should also be noted that rope ranges have the advantage in regards to Cross Shade Variation(CSV), which refers to differences in color from side-to-side in the fabric. CSV is basically a result of dye circulation system design where the Indigo enters the dye box from the side instead of the front. In rope ranges that are designed with that style of circulation there is also some difference in the yarn color from to side-to-side, but unlike sheet ranges where the yarns are fixed in their final fabric position, the yarn ropes can be blended to remove the side to side effects. There have been some newer designs of Loop indigo machines which have greatly improved CSV. Rope ranges have been designed to apply the widest range of dyeing techniques. 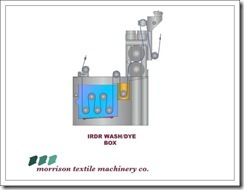 For example, the Spectrum Dye Machine available from Morrison contains features like additional steamers and drying sections that allow not only the standard dyeing techniques of sulfur bottoming and topping, but also consistent application of all other cotton dyes such as vats, reactives and directs in combination with Indigo or dyeing yarns with these dye classes only. Also available are specially designed dye boxes that allow the simultaneous dyeing of 2 different sulfur applications, such as one set of yarn with a sulfur topping and the other set without topping, or with only a sulfur color, which allows flexibility in production. Rope ranges are also easily adaptable for random effects such as space dyeing of yarn. With the rope design, yarns from different dyeings such as Indigo only and sulfur only, can be blended for producing stripe patterns. Common methods of operating Indigo machines have a damaging effect on yarn quality which results in very high warp breaks in weaving, lowering efficiency and increasing off quality. Yarn on the machines is made weaker as yarn tension increases. Sheet Indigo machines, because they are attached to size machines, have very high levels of yarn tension and therefore higher weaving breaks than yarn dyed on rope ranges. A yarn quality that would result in 10 warp breaks per million weft insertions without Indigo dyeing often will have around a break level of 200 with sheet dyeing, but as low as 15 if processed on rope machines. This is because tension on rope machines is much lower and can be easily controlled at very low levels. Another important cause of high weaving breaks in denim is dirty yarn – the cleaner the yarn the higher the weaving efficiency. This is because chemicals not washed from the yarn after Indigo dyeing result in bad sizing and lower protection of warp yarns. Wash boxes on rope ranges are typically more efficient than the smaller wash boxes on sheet ranges that use overflow washing methods. The importance of washing the yarn dictates that it is better not to apply softeners in the final box for rebeaming efficiency which is optimal though improved washing and moisture control after drying. The need for a separate rebeaming step in rope dyeing is often considered objectionable in rope dyeing, but this is actually an important advantage, since yarn breaks can be repaired at rebeaming resulting in higher weaving efficiencies. Yarn breaks from warping and dyeing cannot be repaired in sheet machines because they are passed directly from dyeing to sizing. Sheet ranges are usually limited to producing yarn for only 1 weaving set at a time. In a rope range, normally 12 ropes will produce enough yarn for a weaving set and because rope ranges do not pass the yarn directly to the size machine, from 1 to 50 ropes can be dyed at one time. Any combination of yarns can be processed for completely different fabric constructions at the same time and dyed with the same Indigo color. Also, rope ranges can be operated continuously without stopping, which avoids the waste of yarn which occurs when sheet ranges must stop in order to change yarn lots. Because the yarn is sized separately.higher priority fabric orders can be processed without delays resulting from the need to complete a dye set as with sheet dyeing. This is a guest post by Harry Mercer. Mr. Mercer has 30 years experience in the denim business including 3 prominent U.S. denim companies. He is an expert colorist for measurement and color matching as well as textile testing. Harry Mercer has 30 years of experience in the denim business including working for 3 prominent U.S. denim companies. He is an expert colorist for measurement and color matching as well as textile testing.